The Polymath Chronicles: Tis the Season, for Braising! Tis the Season, for Braising! I hope everyone has recovered from Thanksgiving and is gearing up for the rest of the festive season. 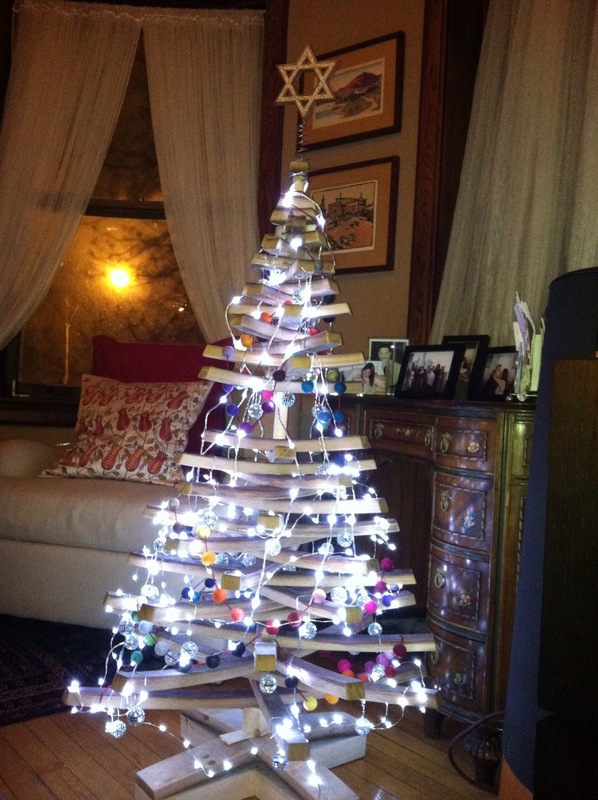 Charming Suitor and I have set up our first Xmas Tree/Hanukah Bush. I think it is adorable. We kept it simple, little fairy lights, mini mirrored disco balls for sparkle, and a garland of felt balls in 40 different colors for bright. And of course, the traditional Star of David topper. It is made of salvaged staves from French oak wine barrels, and if you are curious, yes, wine does smell just as festive as pine. Despite the fact that as I write this it is in the mid-60s outside, it is still Fall and for me, Fall means braising. I love the way a slow cooked dish makes the house smell delicious, I love that they are dishes that are almost impossible to screw up and don't need fussing. I love that they are the perfect thing for dinner parties, letting you make your main course the day or even two or three days before and reheat in a low oven, making for a relaxed hostess. As promised, I want to share one of my new favorite braises, a basque-inspired stew of chicken thighs and chorizo sausage and chickpeas. It is a wonderful bowl of spicy and savory warmth on a cold night, and is great for a casual Tuesday night dinner for two or a Saturday night dinner party for eight. Serve it with a warming Spanish rioja or a crisp white Gruner Veltliner. A simple salad of butter lettuce dressed with lemon, olive oil, and fried capers and some crusty bread are all you need for a complete and lovely meal. 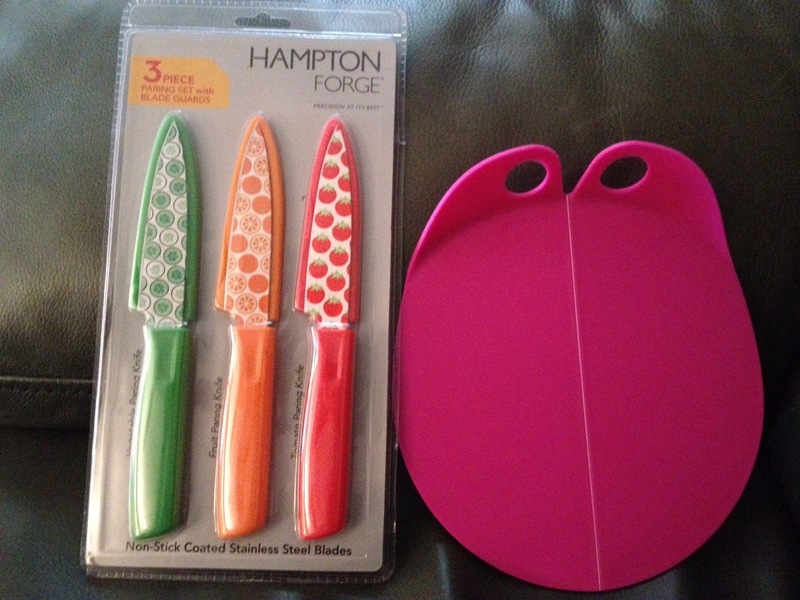 And since it is time for a new recipe, how about a new gadget! This is a recipe rock from Architec! I'm loving this thing. I keep all my recipes in my computer. When I want to make something, I print a copy, that way it doesn't matter if it gets stained or shredded, I just throw it away when I am done. But I'm always elbowing it off the counter, or trying to keep it out of my way. For a while I was taping recipes to the kitchen cabinets. Not anymore. 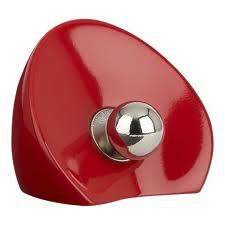 A very cool and simple item...there is a powerful magnet in the base, and a ball bearing. You can take your recipe or recipe card and slide it between the ball bearing and the base and it holds it upright so you can read it easily, and it stays out of the way! Even better, it is VERY reasonably priced and a perfect stocking stuffer or small Hanukkah present for your favorite cook, or a happy present for yourself. Put a large deep saucepan or skillet over medium heat. Cook the chorizo, stirring occasionally, until chorizo has rendered its fat and is brown and crispy. Remove chorizo with a slotted spoon or spatula to your slow cooker, leaving the fat in the pan. Season the thighs with salt and pepper on both sides. Add the chicken pieces to the skillet and brown well on both sides, especially making sure to render the skin so that it is crispy about ten minutes total. Remove the chicken pieces and set aside. Remove all but two tablespoons of fat in the skillet. Add the onions, garlic, artichokes and thyme. Season with salt and cook, stirring occasionally, until vegetables are soft, about five minutes. Add the sherry, tomatoes, paprika, and red pepper flakes. Stir well to dislodge any browned bits and simmer for one minute. Add this mixture to your slow cooker, put in the chickpeas, and stir to be sure it is all well combined. Nestle the thighs in the mixture in your slow cooker. Put in enough chicken stock to come up to the thighs, leaving the top ¼ inch uncovered. Cover the slow cooker and turn on High for at least 3 hours. You can then turn to low and hold till dinner time, or cook on low for up to 8 hours. Before serving, season to taste with salt and pepper and garnish with basil. Serve. If you don’t have a slow-cooker, you can cook in a covered Dutch oven at 350 for 1 ½ hours. I also love this over cous cous or brown rice. Also? Charming Suitor and I were so hungry for it, and it smelled so delish that I totally forgot to take pictures for you, so you'll have to believe me when I say it was lovely to look at, all burnished reds and golden browns. Very Autumnal. 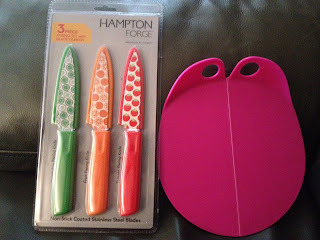 So, to celebrate this season, comment with your favorite slow-cooker or braised recipe by 11:59 CST on Sunday Dec. 9, and I will pick one for a little prize package of a Hampton Forge Paring knife set (one veggie, one fruit, one tomato all with covers) and a small folding cutting board to easily get your chopped stuff to the pan. Winner announced next Monday! Can't go wrong with pulled pork in the crock pot, meals for days! Best I ever had was a vegetarian Taco Dip. Tofurky, Black Beans, Sour Cream, LOTS of Cheese, and Salsa! It was AMAZING! My favorite slow cooker recipe is beans and ham. So tasty, and fills up my family of boys with one bowl. My hubby loves loves LOVES turkey. We stock up on frozen turkey breasts around the holidays and we roast a turkey breast in the slow cooker at least once a month. Mix together and rub on turkey breast. Chop 2 lemons, peel and smash 3 garlic cloves and pack inside the turkey. Slow cook on low for approx. 7 hours. Combine onion, garlic, carrots, chili powder, oregano, jalapeno/chipotle, salt and pepper in a 5-quart (or larger) slow cooker; stir. Add remaining ingredients; stir again. It's even weight watcher friendly! My new fave recipe is Tomato Basil Parmesan soup! 1. Place pork in crock. Combine remaining ingredients and pour over pork. 2. Cover. Cook on LOW 10 hours or HIGH 6 hours. Remove pork from crock and shred meat. Discard fat but do not discard the liquid/sauce. 3. Serve pork on sandwich buns, and spoon additional liquid/sauce on top as desired. My favorite slow cooker dish is Pumpkin Lentil Stew -- it's a fantastic filling stew that can also be used as a dip. One of our faves in the CrockPot is Italian Beef. Cook on low for 8-10 hrs. Delicious served over a crunchy bread. Spray 5- to 6-quart slow cooker with cooking spray. In cooker, place potatoes, carrots and onion. Top with corned beef (don't forget to rinse the beef REALLY well to get the excess salt off); sprinkle with contents of seasoning packet. Add beer and enough water to just cover corned beef (I have used just water and it works fine). Cook 10-12 hours on low. Remove veggies from crock pot juices, slice beef thin and serve with veggies on serving dish. One of my favorites is Hawaiian chicken. Stacey, how cheesy is this: my favorite slow cook recipie is for the Chicken Soup with white beans that you posted on this site a couple of years ago....it became an INSTANT classic at my house and we just had it this weekend! I can't remember which post, exactly, but you had been sick and it was a cure-all chicken soup. I don't have the recipie in front of me but it involved white beans, leeks, carrots, sage and thyme sachets, and a whole chicken. The only thing I do differently is add some egg noodles at the very end for my kiddos. It's creamy and delicious and we all love it!! My absolute favorite braise: Syrah-braised short ribs. Mmmm, the layers of flavors are just amazing. I found a weekday pot roast recipe on allrecipes.com and it is amazing!! It uses canned gravy, which you would think wouldn't be that good. But, with the extra herbs and spices you add, it turns out so yummy! It takes only 15 minutes to prepare and then just cook all day. My boyfriend loves it and that's saying a lot because he is one picky eater! Yes you can substituted breasts, but be sure they are bone-in and skin-on, boneless skinless breasts will just dry out and get stringy. White Chicken Chili! Serve with Fritos and shredded cheese. Crazy good. This sounds aahhhhhhmaaaaaaazing! I can't wait to try it. My favorite slow-cooked recipe is a pork roast braised in apple cider with onions and thyme.